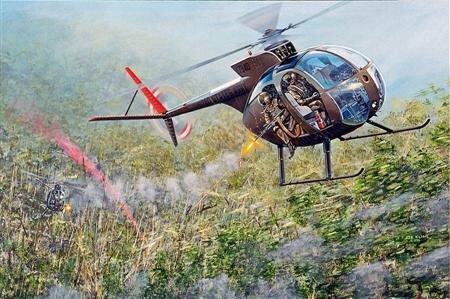 The OH-6A Cayuse, better known as the "Loach" was a light observation helicopter used extensively for scouting. They were often employed as "bait" for the heavily armed AH-1G Cobra gunships in hunter/killer missions where the Loach crew would find the enemy by flying low and slow, then mark the target for the gunships. The Loach crew was heavily armed with automatic weapons, grenades, and sometimes a minigun. For the customized version, the artist will apply unit markings, and can modify the crew placement.